MONTREAL -- Byron Bitz hoped his time would come in the 2009 Stanley Cup Playoffs, but he never imagined it would come so soon and in such a hockey-rich city. Bitz, a 24-year-old rookie right wing, goes into Boston's lineup for Monday night's Game 3 as a replacement for the suspended Milan Lucic. Boston leads the best-of-7 series, 2-0, and is looking to deliver a knockout punch, while Montreal will be clawing to extend the series to at least five games. Bitz, a physical player with less offensive skill than Lucic, will play on the fourth line with Stephane Yelle and Shawn Thornton, a line on which he has seen most of his duty during his 35 appearances this season. "It'll be a fun environment to play in," Bitz said of Game 3 here at the Bell Centre. "The fans are great here and I'm sure the building will be rocking." So, does that mean Bitz is nervous about walking into an atmosphere that has been known to intimidate even the most-experienced players? "(The butterflies) aren't too bad," Bitz said after the morning skate. "It's a little different, I guess. Around 7 p.m., I'm sure it'll be a little different, but it's about controlling that nervous energy and using it in a productive manner." Bitz, who started the year in Providence of the American Hockey League and who is in just his second pro season, has been a productive role player for the Bruins this season by playing a simple, north-south game, heavy on hitting. "I tend to play between the whistles and play hard; that's my game," Bitz said, adding he is comfortable playing with Yelle and Thornton. "There's definitely some familiarity there, we've played a lot of games together this year. We have some cohesiveness and I like playing with those guys and, hopefully, we can be a factor tonight." MONTREAL -- The Boston Bruins may not be happy about the one-game suspension levied against Milan Lucic, but they have accepted it. Lucic will miss Monday night's Game 3 against the Montreal Canadiens here at the Bell Centre (7 p.m. ET, CBC, RDS) after being suspended by the League on Sunday for the match penalty he incurred in the waning moments of Game 2. Lucic struck Montreal forward Maxim Lapierre in the head with his stick. "Right now, it's not important what I think," Boston coach Claude Julien said after Monday's morning skate. "We have a game to prepare for and we have to do it without him. Once the decision is rendered, you have to accept it and move on. That's what we are going to do." Lucic also said he accepted the decision, which was rendered by Colin Campbell, the NHL's senior vice president and director of hockey operations. "He made a decision that he felt was right and I respect his decision," said Lucic. 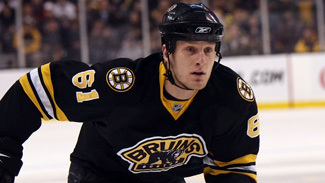 Rugged rookie forward Byron Bitz will replace Lucic in the lineup, playing on the fourth line. Blake Wheeler, who played on the fourth line in the first two games, moves back up to the second line, playing the left wing on a line with David Krejci and Michael Ryder. The suspension is the latest incident in an eventful series so far for Lucic. A physical forward that has irritated Montreal throughout the regular season, Lucic was a target of some inflammatory pre-series comments from Montreal tough guy Georges Laraque. Then, before Game 1, those same two players repeatedly exchanged pleasantries during the pre-game skate. And throughout the first two games, Lucic has been trying to put his physical stamp on the series. He has a series-high eight hits and also leads all players in the series with 24 penalty minutes. But he crossed the line by striking Lapierre with his stick late in the third period of a game Boston was winning 5-1, earning the match penalty that turned into a one-game suspension after Sunday afternoon's disciplinary hearing with Campbell. Now, he has to pay the price by sitting out a pivotal Game 3, a game in which Boston could put a stranglehold on the best-of-7 series with a victory. "I guess you could say I'm a little disappointed in myself because I think our team has done a good job of being disciplined this whole series, so a little disappointed that way," Lucic said. "You always want to be out there doing what you can to help your team win." Chiarelli says that Lucic has been spoken to about his transgression and Chiarelli believes that Lucic has learned his lesson. "He's got to be more careful with his stick and we talked about composure," Chiarelli said. "He was very disappointed in himself and knows our coaching staff has been preaching discipline and that is something we expect him to carry forward for the rest of the series."